I personally support going the natural way of dealing with things, but it can change when the fun and safety of my kids are involved. We tell our kids how their teachers are like their second parents at school so why not make school a better and safer place for kids to consider it as their second home too? 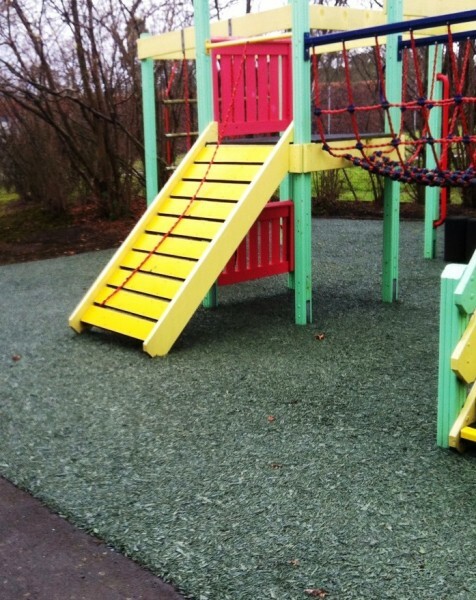 Playground and parks normally have grass flooring which helps make the place children friendly but there are cases where natural grass areas become muddy and unsafe in wet conditions, thus; where Rubber Mulch comes in handy as it provides a natural looking flooring option which still protects kids from injuries when using play equipment. A friendly place to get more information on what Rubber Mulch is and how to get it installed on outdoor playground, recreational areas at schools nurseries and even on parks can be easily found at Soft Surfaces. What I love most about this ingenious idea is that they reused truck tires which also promotes the importance of reusing waste and turning it into something that helps people. You also won't need to do any ground works like removing trees. It can even be installed on mud and tarmac surfaces as it's particularly adaptable. A big +1 for being environment-friendly right? There are no more worries when we see our kids fall down with the impact absorbing rubber mulch. We can simply let our kids be kids and let them pick themselves up whenever they fall down. A +1 on parenting for that part I must say. Children learn as they play. Most importantly in play, children learn how to learn.